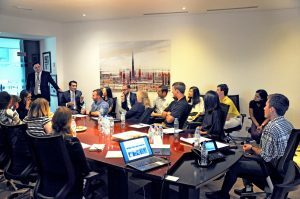 Graduate students from a top business school in the United States visit Dubai to experience, first-hand, the increasingly globalized nature of business. May 28, 2018, Dubai, United Arab Emirates: Students from the University of Virginia’s globally-ranked McIntire School of Commerce have completed a 5-day visit to the UAE to visit businesses as part of the University’s Global Immersion Experience (GIE). United World Infrastructure (UWI), the Dubai and Washington, DC-based firm hosted the group of 20 graduate students, Professor of Commerce Saonee Sarker, and Associate Director of Annual Giving & Engagement Chera Teague on the last day of their tour in the UAE to introduce them to infrastructure investment and development in emerging markets. The UAE was the first stop on their 3-week academic tour which will involve travel to Dubai, Abu Dhabi, New Delhi, Bangalore, and Johannesburg with stays of about 4-5 days in each country. As part of UWI’s program for the students, members of its leadership team – Founder / Principal Vafa Valapour, Managing Director Aaditya Sarna, Finance Director Sanjay Sanghavi, and Technical Director Amr Youssef – shared UWI’s approach to building cities which integrates expertise in designing built environments, structuring investments, managing city services, and establishing policy frameworks in a way which attracts investments and creates a livable city. UWI’s founding Principal Vafa Valapour and Managing Director Aaditya Sarna speak with graduate students visiting from the University of Virginia’s McIntire School of Commerce about their personal experiences investing in, designing, and developing cities in emerging markets. “I thought what was fascinating was that you could be a developer, or an investor, or a city manager. All three can be brought in together and I thought they were very different services but UWI clearly stands at the center of all of these three,” Professor Sarker shared. The Global Immersion Experience (GIE) is an intensive, graduate-level, academic program designed to expose students to the increasingly globalized nature of business. It is the capstone experience of the McIntire School of Commerce’s one-year Master of Science in Commerce degree. The Economist magazine ranked McIntire’s M.S. in Commerce as the #2 Masters of Management program in the world in 2017. Students come into the program with undergraduate degrees in engineering, computer science, economics, languages, and psychology, among others. The program offers a choice of concentrations in finance, marketing and management, or business analytics. Prior to going abroad, students undertake coursework focused on macroeconomic influences on business and intensively study the countries to be visited – participating in case studies, project work, seminar discussions, and cultural learning in preparation for their time overseas. The program exposes the students to possible careers around the world. The University of Virginia, founded and designed by the 3rd president of the United States, Thomas Jefferson, is consistently ranked as one of the top three public universities in the United States (currently ranked #3 best public university in 2018 by U.S. News and World Report). Students are admitted based on a record of high academic achievement, public service, and demonstrated leadership. The McIntire School of Commerce, a school within the University of Virginia, is among the oldest business schools in the United States. In 2018, Poets&Quants for Undergrads ranked it third among U.S. undergraduate business programs. In the nine years (2006-2014) that Bloomberg Businessweek ranked American undergraduate business programs, the McIntire School Program is the only program to have been ranked either first or second each year.